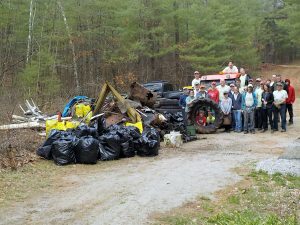 In the last seven years, 9,404 volunteers have collected 321,899 pounds of trash from parks, rivers, and roadways throughout The Last Green Valley National Heritage Corridor thanks to the funding. Recipients will be reimbursed up to $500 for expenses such as publicity, cleanup supplies such as trash bags and work gloves and food and refreshments for volunteers. TLGV will also help publicize your event and work with you to recruit more volunteers. Basic details about your cleanup – what, when, where, and who – plus your contact information, including a phone number, street address, and email address. A budget detailing how you will use TLGV funds. Who will be picking up and disposing of the trash (we can’t cover that cost). How you will involve youth – the future stewards of The Last Green Valley. Describe how you will publicize not just the event, but the results. For nonprofit organizations, submit a copy of your 501(c) letter from the IRS. TLGV reserves the right to approve or deny funds based upon the likelihood of project success and the availability of funds. We will contact you within two weeks of your submission. If TLGV approves funding, you will need to sign a short agreement and you must promise to acknowledge TLGV’s funding in your publicity materials. To help compile accomplishments, you must also complete and return the TLGV “Trash Tracker” forms after the cleanup. For more information, email LyAnn Graff or call her at 860-774-3300. The cleanup fund is sponsored by bankHometown.